Yep, you heard me correctly. Today is the 70th Birthday of Spam canned luncheon meat. OC called me from work to tell me he'd read about it on the front page of the paper during his morning commute. I teased him a bit and promised him I would go to the store and get him some Spam for dinner. He demurred, but encouraged me to read his post. Me being me -- upon being told the tribute to Spam never made it online -- I of course had to check. I did not find the birthday tribute, but I did discover that Hawaii leads the nation in per capita Spam consumption! Well, that did it. I had to go to the store and buy a can of Spam. I haven't had the stuff since I was a teen, maybe in the last several (okay, several dozen) years or so, it has gotten tastier. Once in the store I was shocked to discover that Spam is no longer a single entity, but has grown into a whole family of products! The second shock was the number of people crammed into the canned lunch-meat isle. They were all buying Spam. One woman told me she was making Spam Chili. Another woman -- this one in line with me at the check-out counter -- told me that the 25% less sodium Spam, which I was purchasing, had 75% less taste. She said that once she took a can of it home and neither her husband nor the dog would eat it. Since I have neither husband nor dog, I haven't quite decided what I am doing with the can of Spam sitting on my kitchen counter. Perhaps I will do what another shopper in the cash register line said she was going to do and put the Spam in my cupboard to save it for the 100 year anniversary. "By then," she said, "I might be senile enough to actually eat it." Melli -- this isn't a paid advertisement, it's just a little Hawaiian humor. Did you read OC's post? You can actually buy Spam at the fast food restaurants here. And when I lived in Vegas I went to a Hawaiian restaurant that had a "Spam Burger" on the menu. we used to eat it at our house all the time and didn't think a thing about it..
Hmmmm, so that's how you eat spam is it? I've never known. Lucky me! Morgan -- when you come to Hawaii to dive, Spam is indefinitely on the menu! Minka -- YOU have male reproductive organs? Is this a confession? Argh! I have no idea who I am, where I am or what I am doing! Too many blogs! I'm rolling with laughter. 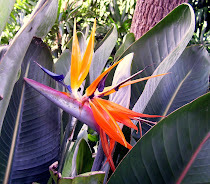 We lived on Oahu several years ago and are contemplating retiring there. 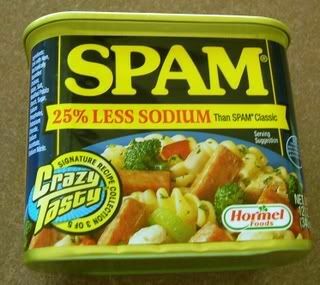 While I never learned to savor SPAM, my children love it. SPAM musubi is a favorite around here.